Troy Lee Designs/Red Bull/KTM’s Jordon Smith is having a solid year of supercross and goes into the final round sitting second behind Osborne in the championship battle. We saw last year that anything is truly possible in Vegas and will get his thoughts on the finale and season tonight. Rockstar/Leatt/Maxxis Husqvarna’s Ryan Sipes has truly done it all in his career and doesn’t seem to be showing any signs of slowing down. We will have our Kentucky brother on the show tonight to discuss his plans for the summer, including some that will make the Two-Stroke faithful very, very happy! Monster Energy/Yamalube/Star/Yamaha Factory Racing’s Wil Hahn will join us to celebrate a monumental occasion in his young life tonight. We thoroughly enjoy our time with Wil and just adore this guy away from the show, too. 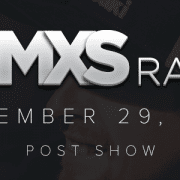 DMXS Radio thanks DUNLOP, Coach Robb Beams, MyLucasOil.com, Moto Dynasty, Racer X, MX Sports, DUBYA Wheels, OGIO, and Concept2 Rowers for their continued support. DMXS Radio has been making Bad Billy proud since 2001!